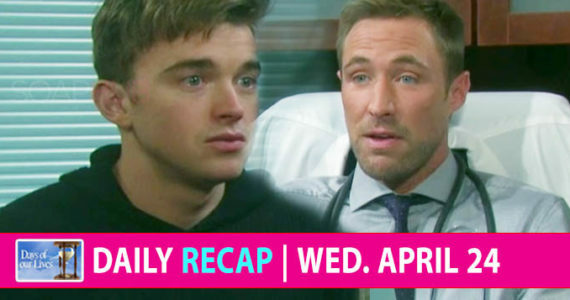 Days of Our Lives Spoilers: A Brady And Will Showdown You Won't Forget! Days of Our Lives Spoilers: A Brady-and-Will Showdown You Won’t Forget! A Brady-and-Will Showdown You Won't Forget! Days of Our Lives spoilers for Wednesday, September 12 promise a day of shocking confrontations and emotional situations. You won’t want to miss a moment of this action-packed episode. Brady (Eric Martsolf) has more on his mind than he can handle. Both Marlena (Deidre Hall) and Paul (Christopher Sean) are in the hospital and crazy Kristen (Stacy Haiduk) is still the loose. So when he catches Will (Chandler Massey) and Sonny (Freddie Smith) in yet another intimate moment, it sets him off in an explosive way nobody expects. He’s furious about Will betraying his brother after Paul risked his life to save Will’s mother. Will Sonny stick up for the man he loves or will they realize Brady could be right about how they’re oh-so wrong. Jennifer (Melissa Reeves) has been going back and forth about telling Eric (Greg Vaughan) the real reason why Nicole (Arianne Zucker) left him. It looks like she’s made a decision because she puts Eve (Kassie DePaiva) on notice. How will Eve react to learning her whole world may blow up at any minute? Will she even let Jennifer tell the truth? Or rather — can she stop her? John (Drake Hogestyn) will do anything to save the woman he loves but this latest news from Belle (Martha Madison) makes him feel betrayed by her actions. He doesn’t care what Marlena may have thought she wanted — he needs her to be given the time to fight back. Belle insists they have to follow what Marlena wanted and moves forward to make it happen. Will John ever find it in his heart to forgive their daughter? Lucas (Bryan Dattilo) is still reeling from meeting his and Bonnie’s (Judi Evans) “daughter” by Bonnie. Whether this baby is his or not, he knows it’s something he can’t keep this all to himself and tells Chloe (Nadia Bjorlin) about Bonnie’s claim. Will Chloe have some words of wisdom to get him through this? And, if he does believe it, will he lift a finger to help Bonnie avoid jail time?